Little Krishna 3 DVD Set Now On Sale! Little Krishna, the first ever multi-million dollar 3D animated Krishna television series is now available on a 3 DVD set! Produced in conjunction with ISKCON. Contains the 13 television shows originally broadcast on NickTV in India. Little Krishna features stunning graphics, bringing Krishna's Vrindavan pastimes to life. English audio with English or Hindi Subtitles. ***The DVDs are in PAL Format. See bottom of description for information. The three DVD set of "Little Krishna" is a result of seven years of painstaking research work, handpicked from the pastimes of Krishna, the most remarkable stories of the legendary prankstar in the Indian heritage. The episodes are narrated in a manner, engrossing enough to mesmerize the audience world over, and leave them spell-bound. 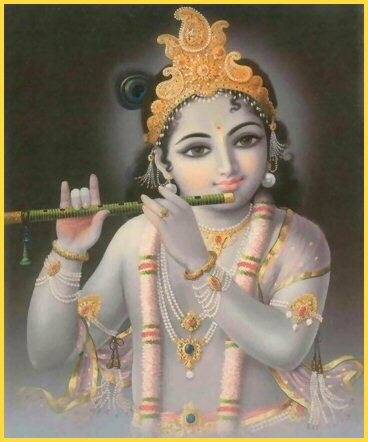 Little Krishna is the darling of Vrindavan, the land of peace and tranquility, which is constantly threatened by the malice of evil king Kamsa. While Krishna is busy with his endless pranks and mischiefs accompanied by his friends, Kamsa remains restless for he is aware that Krishna is his nemesis. As in the past, a prophecy had threatened Kamsa that his evil reign is over, and a savior will descend on earth to make Kamsa meet his worst adversity in life, which is his death. The only objective of Kamsa's life therefore, was to find his angel of death. Sworn to see the end of Krishna, Kamsa relentlessly sends his trusted aids, the ferocious demons to Vrindavan in order to kill Krishna. But Krishna is born to be a savior as he crushes the deadly demons one after another with heroic poise. Action, adventure, heroic valor, selfless deeds, emotional trysts, mischief's... all packaged in a compelling story telling underlines the hallmark of the "Little Krishna" series. 1 hour special -- "The Making of Little Krishna"
The Little Krishna series has also been released as three feature-length movies: Darling of Vrindavan, Legendary Warrior, and Wonderous Feats. These 3 DVD movies have the same stories as this 13 Episode Little Krishna TV Series 3-DVD set; they have just been arranged into 3 feature-length movies. Note for US and other NTSC TV System Countries: The 'Little Krishna' DVDs are all-region, so they will play in any country, however they are in the PAL TV format. While many NTSC DVD players will also play PAL DVDs there are some NTSC DVD players that will not be able to play these DVDs. 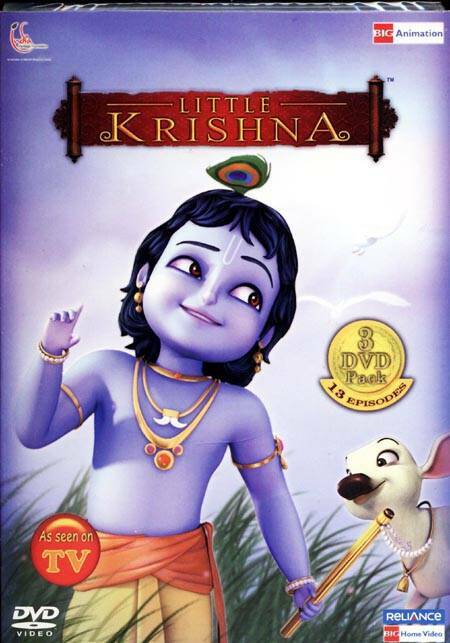 However the 'Little Krishna' DVDs can be played on all computers, all PAL DVD players and a large percentage of NTSC DVD players. Most of the very inexpensive NTSC DVD players [less than $20] can play PAL DVDs. PAL is the standard format for DVDs in most countries. The USA and Canada, however, uses NTSC as the main format. Therefore, some DVD players in the USA and Canada do not read disks the PAL format, but virtually all computers with DVD drives can read PAL. Check the users manual for your DVD player to see if it can read PAL format disks. Contact your local electronics store to see what inexpensive DVD players they may have that can read PAL DVDs. Currently viewing: Little Krishna 3 DVD Set Now On Sale!